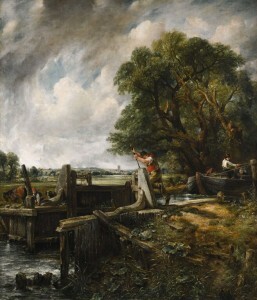 The Lock, one of John Constable’s most famous compositions sold for £9,109,000 at Sotheby’s London last night. It was painted c1824-25. The monumental landscape depicting the countryside of the painter’s “careless boyhood” was the highlight of the Old Master & British Paintings evening sale. It was retained by the artist in his studio until the end of his life. The auction totalled £22.6 million. As of last night Sotheby’s has sold $237,619,514 worth of Old Master and British Paintings worldwide in 2015. (See post on antiquesandartireland.com for September 26, 2015). John Constable’s The Lock will be offered at Sotheby’s in London on December 9 with an estimate of £8-12 million. It has been in the same family collection for over 150 years and is on the market for the first time since 1855. The Lock is one of the small group of monumental landscapes, known as the ‘Six Footers’, which for many define the pinnacle of the artist’s career. Depicting a bucolic scene on the River Stour in the artist’s native Suffolk, and painted in response to the huge critical acclaim that greeted Constable’s first treatment of the composition exhibited at the Royal Academy in 1824, the picture was treasured by the artist. He retained it in his studio till the end of his life. It was singled out by him for prestigious exhibitions, and chosen as the basis for the engraving that was to make it among the most familiar, and celebrated, images in the canon of British art. 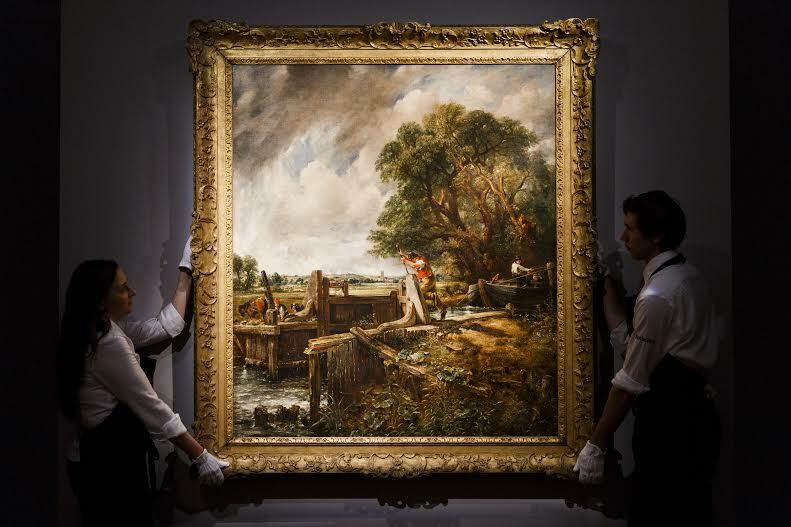 Works by Constable are extremely rare in private hands and on the market and this masterpiece will lead the Old Master and British paintings sale. Of the other paintings forming the Six Footers – the Stour landscapes – all but two are in public institutions. Julian Gascoigne, Sotheby’s senior British pictures specialises said: “Constable’s absolute mastery as a landscape painter is everywhere in this picture”.